Training Provider: Big Apple Occupational Safety Corp.
Why Should You Take This NYC 4-Hour Supported Scaffold User Safety Training Course? The NYC 4-Hour Supported Scaffold User Safety Training course complies with the training requirements of the New York City Department of Buildings Local Law. This course is required for anyone who will use or work on supported scaffolds of any height. 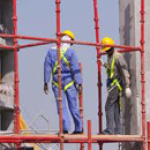 In this course, students will learn how to properly erect and load scaffolds, prevent fall and electrical hazards, Chapter 33 building regulations, ladder safety, how to properly wear a full body harness and much more. In addition, anyone who uses a supported scaffold is required to have a supported scaffold user certificate. The certificate is valid for four years. Supported scaffolds are one or more platforms supported by outrigger beams, brackets, poles, legs, uprights, posts, frames, or similar rigid support. This includes sidewalk bridge scaffolds, single pole scaffolds, tube and coupler scaffolds, fabricated frame scaffolds, outrigger scaffolds, needle beam scaffolds, mobile scaffolds, repair bracket scaffolds, mast climber scaffolds that are mechanized or motorized. Course Completion Certificate: Upon successful completion of the course, participants will receive 4-Hour Supported Scaffold User Certificate that will be valid for 4 years. Prerequisites: There are no prerequisites for attending this course. Certificates Same day as course completion for weekday classes. For weekend classes, certificates are issued the following Monday, and are mailed or students can pick them up at the training facility. Below are the most recent student reviews for previous NYC 4-Hour Supported Scaffold User Safety Training Courses. The instructor was great. I learned some new information about Scaffold Safety! The instructor was great. I learned some new information about Scaffold Safety! The instructor was a lively woman with valued real world experience that aided in the class. The instructor was a lively woman with valued real world experience that aided in the class. He did a very good job of mixing lecture and discussion. He did a very good job of mixing lecture and discussion. The course was ok. The course was ok. The teacher gave a good presentation and on time, he was able to get across the information in an understandable fashion,... The teacher gave a good presentation and on time, he was able to get across the information in an understandable fashion, the video at the end was very helpful as well. Teacher was great! Teacher was great! From booking class to completion .. it was very smooth. Instructor was excellent! From booking class to completion .. it was very smooth. Instructor was excellent! Pretty good and important for safety. Pretty good and important for safety. Instructor was very knowledgeable and kept you involved in the class. Instructor was very knowledgeable and kept you involved in the class. I thought Sal did a fine job. Mixed it up with lecture, video, and some hands on. I thought Sal did a fine job. Mixed it up with lecture, video, and some hands on. The class itself was great. A very interactive atmosphere. The only problem was a scheduling issue computer said it was a... The class itself was great. A very interactive atmosphere. The only problem was a scheduling issue computer said it was a morning class but it was actually in the afternoon didn't find out until after showing up. I would still recommend the course, just call and confirm the time. very good. insrtuctor was clear & informative. very good. insrtuctor was clear & informative. Very clear, concise and intuitive. Very clear, concise and intuitive. Very informative and up to date. Never a boring moment. Very informative and up to date. Never a boring moment. He was very informative. Thank you! He was very informative. Thank you! Big Apple Occupational Safety Corporation (BAOS) is an environmental management company committed to the highest quality standards, excellent performance and outstanding customer satisfaction. BAOS uses the state of the art technology, equipment and top of the line expertise in the industry in order to accomplish its goals. BAOS business includes a broad spectrum of environmental services dealing with all environmental aspects from common hazardous material to unique environmentally adverse situation.